With the threat of nuclear war constantly in the news and the sun recently turning a demonic red, it can sometimes feel like the end of the world is nigh. One in 10 Brits even has a contingency plan in the event of a zombie apocalypse. Seriously. So it’s probably the perfect time to consider getting on the waiting list for Under, a restaurant which is basically an underwater concrete bunker. It looks like the perfect place to fuel-up during the apocalypse. 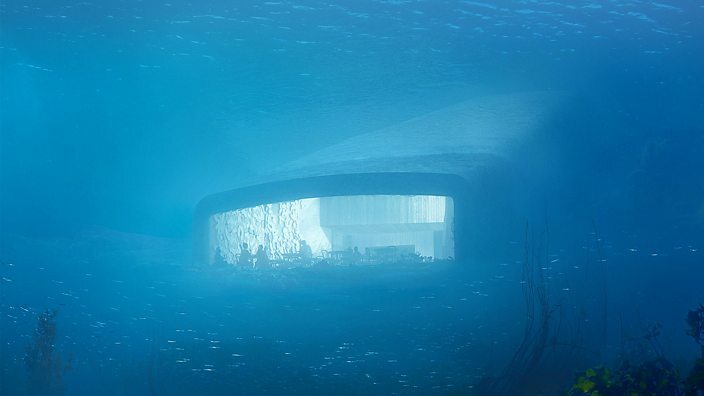 Under will be Europe’s first underwater restaurant. It’s been designed to look like a “sunken periscope” and will sit by the town of Båly on Norway’s southern coast. The brainchild of Norwegian architecture firm Snøhetta, who designed the National September 11 Memorial and Museum Pavilion in New York, it will have space for 100 diners. Construction is due to begin in February 2018. Outside of dining hours, the futuristic venue will double up as a marine life research centre. But, still, with its metre-thick concrete shell jutting out of the sea, it reminds us more than anything of a nuclear bunker. Guests will descend to a champagne bar before continuing down to the bottom floor, which sits five metres deep. 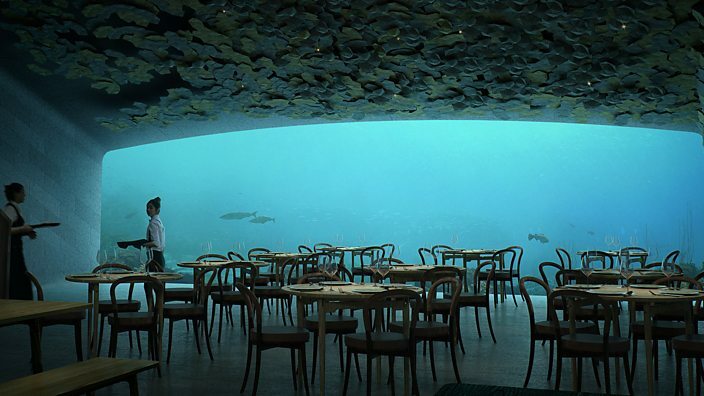 Once safely at their table, they can gaze at the ocean floor through a huge panoramic window. Claustrophobes might want to give it a miss. Here’s a few other eateries that offer foodies a taste of something a little bit freaky. 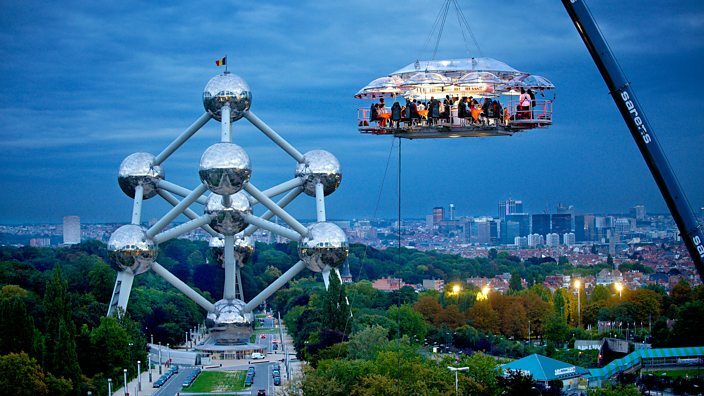 First up, at the other extreme, is Belgium’s Dinner in the Sky experience. Here, guests are strapped to chairs surrounding a dining table and hoisted 100 feet in the air, along with their food, drink, chefs and waiters. Dinner in the Sky began operating in 2006 and has since expanded around the world, with the service running on a pop-up basis across British cities, including Bristol, London and Glasgow. Next, we have Moscow’s slightly eerie Twins Restaurant. The restaurant only hires sets of identical twins to wait tables and tend the bar, with the siblings wearing matching clothing and speaking simultaneously to customers. The restaurant’s owner was apparently inspired by the 1963 Russian film Kingdom of Crooked Mirrors, a freaky fairy tale in which a schoolgirl crosses into an alternate world and finds her twin. Stranger still is Taiwan’s Modern Toilet restaurant chain. These water closet-themed eateries give customers the chance to eat curries, chocolate ice creams and other suspicious-looking foods straight out of toilet bowls. We don’t really know why you’d want to do that, but the restaurants are popular across Taiwan and have a large online following, with over 2,000 Instagram posts under the moderntoiletrestaurant hashtag. Back in London, we have Dans Le Noir. This is the restaurant you may remember from 2013 British romcom, About Time. Translating from French as “In the Dark,” the restaurant offers diners the sensory experience of eating a meal in pitch-black darkness. This seems like a new level of anxiety for a blind date. But on the other hand, after eating underwater, suspended from a crane, served by speech-syncing twins and straight out of a toilet bowl, a glass of wine in a darkened room might be exactly what’s needed.